I’m still in denial that my second summer at Breakthrough Houston has come and gone in the blink of an eye. As a returner to this program, I can honestly say that the past year I’ve associated myself with Breakthrough has been the absolute best year of my life. Breakthrough has given me my future bridesmaids, solidified my urge to be a teacher, and even put me in touch with my future employer, Teach for America. One of my favorite days of the Breakthrough summer is the last day. A Breakthrough day usually starts with students walking through a breakfast bridge filled with teachers chanting everything on the breakfast menu that day. On the last day, however, the roles are reversed and students are the ones making a bridge for their teachers to walk through. The day started off emotional, but I told myself I wasn’t going to cry…at least not at 8:00am when I knew I’d have 15 more hours with my kids. On the evening of the last day of school, we have Celebration. Celebration is a showcase night where Breakthrough students spotlight things they have been working on in their electives and activities. Students perform original plays, recite spoken word poems, play new instruments, dance and sing. Celebration is a night to come together to celebrate the students and congratulate them on another Breakthrough summer in the books. The past two summers, I’ve had the honor of being one of the choir teachers for Breakthrough Houston. I’ve been involved with choir for most of my life, and I’ve always viewed singing as one of my favorite hobbies. Some of my fondest moments these past two summers have been winding down with my choir students after a long day of academic classes and singing Disney show tunes. This year, my choir kids sang “Cups” from Pitch Perfect and “This is Me” from The Greatest Showman. Both songs were fitting not only for my 9th graders’ last goodbyes to Breakthrough but for mine as well. I sat in the front row for their performance, mouthing the words. Whenever my kids were nervous, they knew to look at me for support. After their act, two of my girls gave me the biggest hug and said that they wouldn’t have been able to get through the show had they not had me in the front row, singing along. I’m going to miss being a show-mom to my Breakthrough students, but it only makes me more optimistic about the future and how many band and choir concerts I’ll be conducting or singing along with for years to come. Each year on Celebration night, it is tradition that teachers honor one ninth grade girl and boy with the titles of “Mr. 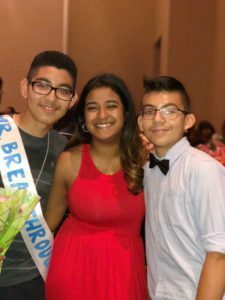 and Ms. Breakthrough.” These students represent all of the Breakthrough character strengths and have exhibited the values of this organization their past three summers at program. One of my highlights of this summer was seeing one of my former students being crowned Mr. Breakthrough. This student made my first summer in the classroom an easy transition as he always cheered me on and picked me up on days when I felt like my world was falling apart. Students like him are the reason I considered even doing Breakthrough another summer. I couldn’t think of anyone more deserving of the title, and I am so happy I was there for one of the bigger moments in his Breakthrough career. The night ends with one final teacher bridge where students walk through the arched arms on the stage and hug each of their teachers goodbye. I promised myself I’d stay strong this year and refrain from crying as much as possible, but I cracked when I saw my former “tough” ninth grade boys crying over their last summer and last few minutes with me. The final bridge is one of the more powerful moments of the Breakthrough summer and a place where the Breakthrough magic is evident. Students cry, saying goodbye to their teachers, nervous that they’ll never see them again. Students cry, knowing that their lives will never be the same and, even when they see their peers during School Year Program in a few weeks, everything will be different. Students cry and dread having to go back to real school after experiencing a Breakthrough summer with the teachers that served as their role models and friends, and their friends that turned into family. I remember leaving Houston last summer broken and empty after having to say goodbye to my students, my teacher-friends, and a city I fell in love with. As I head into my senior year of college and I leave Houston again, I am not thinking of this as a permanent goodbye, and I am optimistic that I will be back in Houston in no time. I am also confident that I will see my students and favorite humans again soon. As my parents often say, “Life is a series of arrivals and departures.” If I don’t make it back to Houston any time soon, I know that I will be back in 2022 to see the loves of my life graduate high school and follow their dreams off to college. Hasta luego, Houston, until next time. Thank you for the Breakthrough magic these past two summers. Want to help teachers like Niki reach more students? Click here to learn about Breakthough’s mission, and click here to make a donation.